Tomas Malone played an ancestor who died on the front line in a poignant re-enactment staged at Carmyle Primary School on Friday 29 May. Tomas (11) took on the role of his great, great grandfather's cousin Lance Corporal William Haddow of the Cameron Highlanders who perished in France during the conflict at the age of 16 years. Haddow was just 15 years when he signed up. He lied about his age to join troops destined for the front line. His name appears on the roll of honour at Carmyle Parish Church. 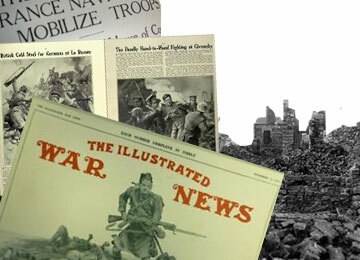 Tomas joined 23 other P7 class mates, taking on the identities of local soldiers, they researched as part of their First World War studies, for the performance. The pupils wore authentic bespoke Tommy uniforms. Tomas said: "I think it's sad that he died at that age. He thought it was going to be over by Christmas." The nine act performance followed the chronology of the First World War opening with William Haddow discussing his intentions to sign up, with pals, in a local hostelry in Carmyle on the eve of war. The last act centred on the last survivor of the group, Corporal William Pollock of the Kings Own Scottish Borderers, from Tollcross, before he too succumbed to the conflict in 1919. 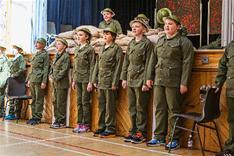 Each act was penned by the children and was interspersed with war songs and poetry. Teacher Anne Hutchison said: "The children have brought local history to life. We were all so excited about the show. The experience of the war and its impact on people from their families and communities lent their studies an underlying authenticity." The uniform materials were donated by City Building's Royal Strathclyde Blindcraft Industries and tailored by their seamstress Inderjit Gill. City Building is a Glasgow City Council Arms Length External Organisation (ALEO). City Building apprentices made the teak bench including Jamie Nelson, an Army Reservist (formerly known as the Territorial Army) who toured in Afghanistan and Kyle Baxter whose great grandfather fought in the First World War.